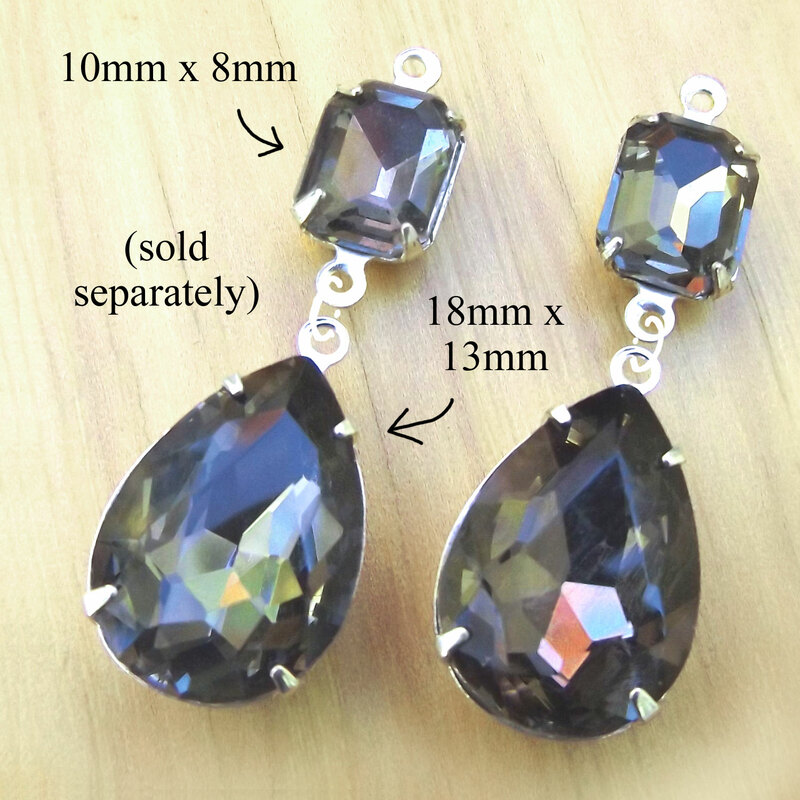 Here’s just one recent example of how you can combine these gorgeous deep gray neutral (black diamond) glass jewels. 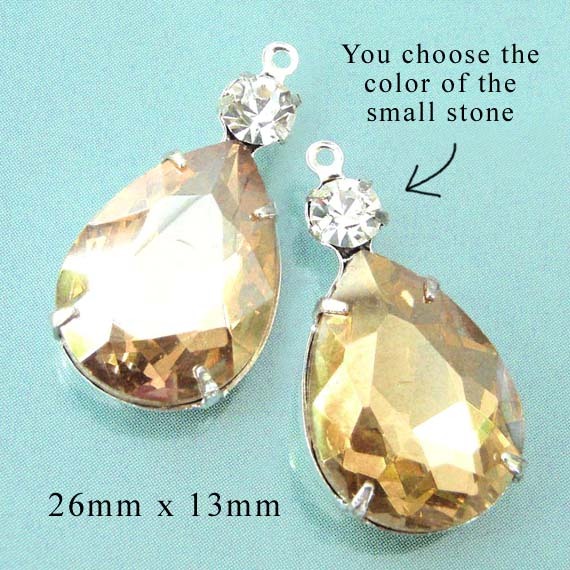 Imagine this style for your new earrings! And for that matter – use just one of these combined jewels for a great necklace. Or add more shapes – hmm, I’ll have to revisit that idea and show pics, won’t I? Stay tuned! This is a closeup, so these jewels look sizeable – actually, they are small(ish). 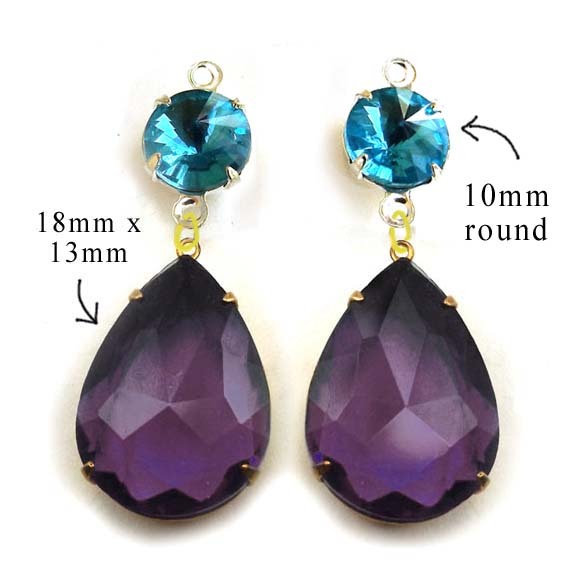 The round rivoli faceted gems are 8mm in diameter (which is between 1/4″ and 3/8″). 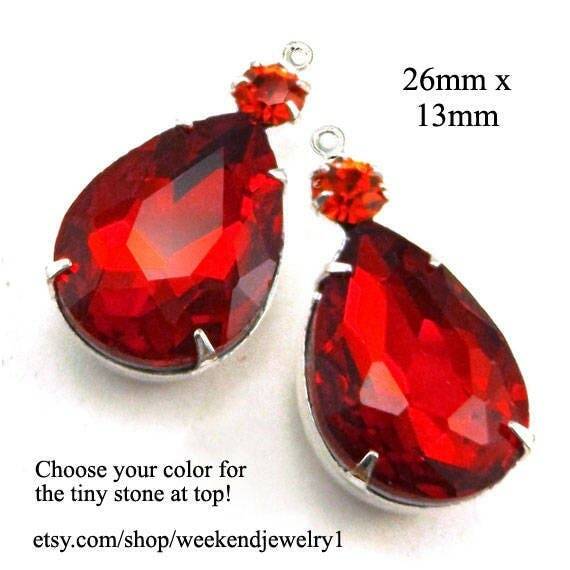 The teardrops are a bit over 1/2″ long – they’re petite. 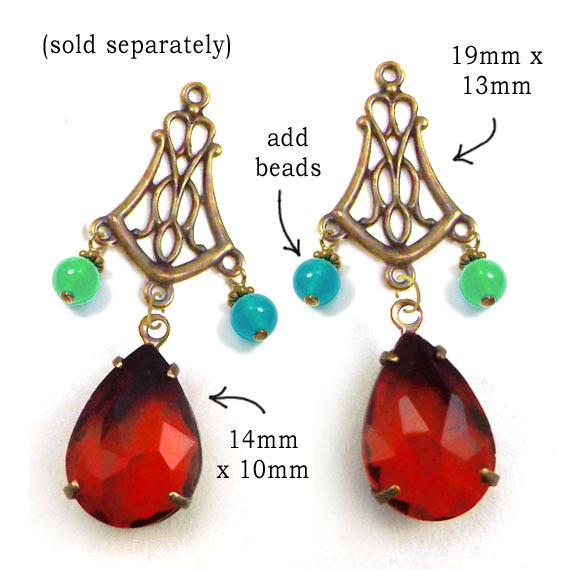 Paired together, the earrings would be maybe 1-1/4″ long – yet as you can see, they have great presence. So – easy to make, in a very interesting and wearable color that’s a bit unusual. The round jewels are new, the teardrops are vintage. A super combo – and affordable too. I bet you have someone on your Christmas list who would love these. Or, what can I say, they’d be fabulous on…you! 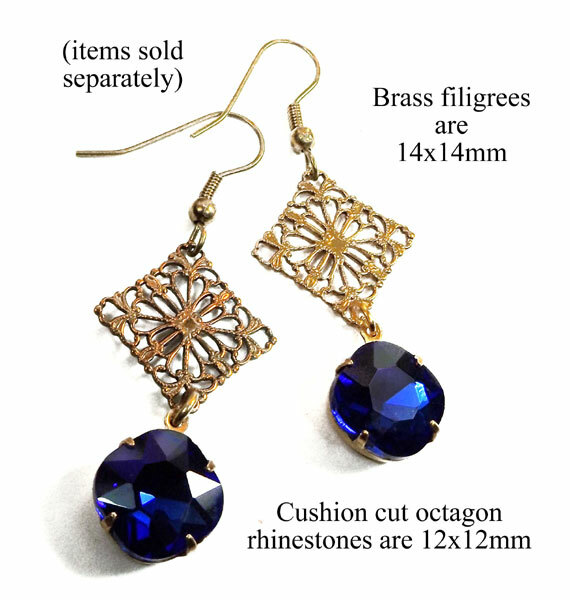 I wanted to share a simple, classic earring design – maybe just as a reminder that a pair of earrings don’t have to be fussy or complex (or super expensive) to be beautiful. I’ve just gotten in the light amethyst tiny rhinestones, and paired them with the aqua rhinestone ovals in a “duo” setting – and I love the way they turned out. 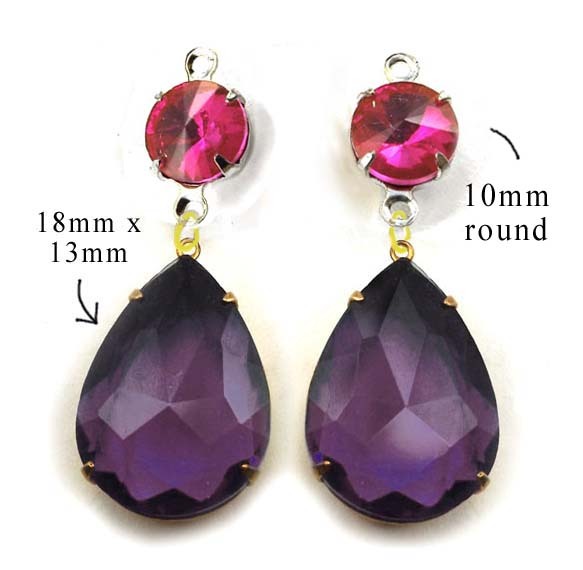 This is a simple idea – a duo setting, pretty faceted stones, and you add earwires – and the earrings are terrific. It doesn’t have to be complicated. 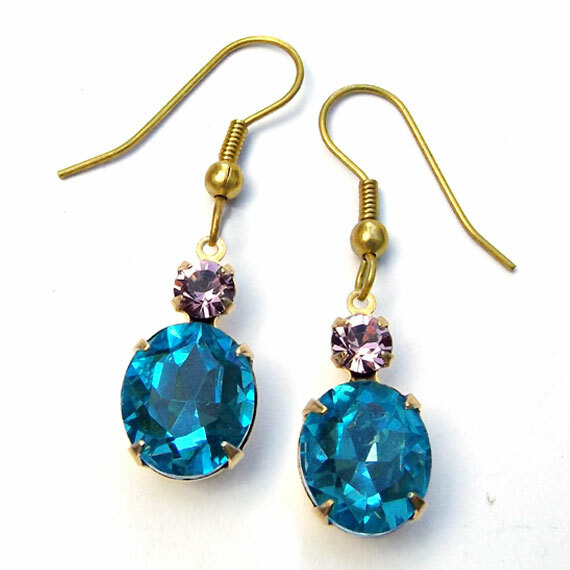 Do you need some earrings to match your bridesmaid colors? Or you just want an unusual color combo because they’re your faves? Just let me know your colors – I bet we can do that! 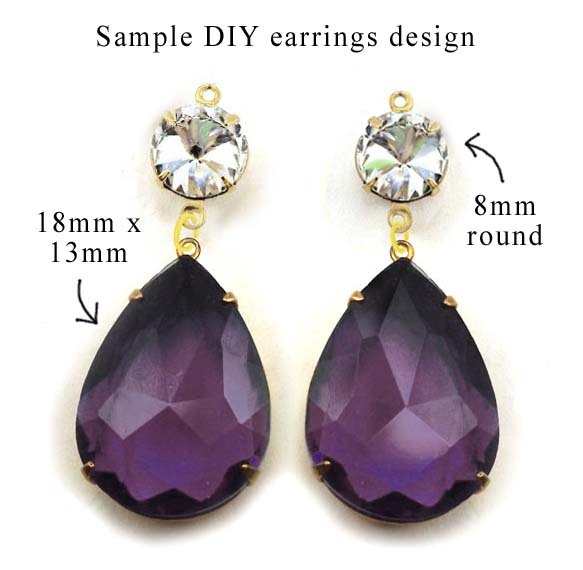 So there are a couple reasons I think this DIY earring design idea is special. 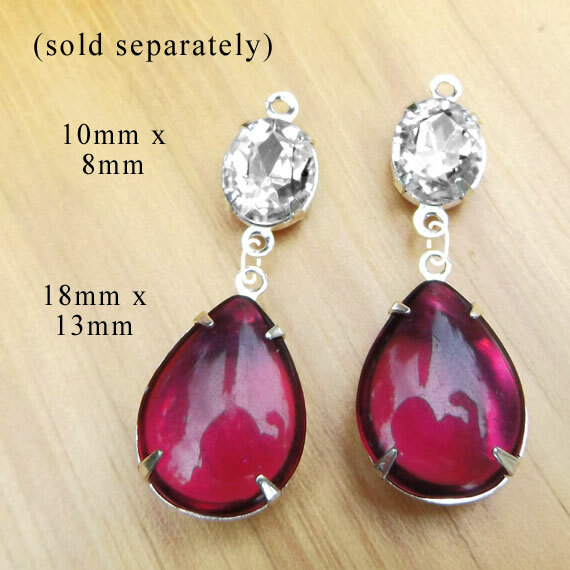 For one thing, deep fuschia pink and crystal? Fuschia doesn’t always work – but when it does, it really does. And what color isn’t even better paired with sparkle? And the combination of textures here – the smooth teardrops paired with the faceted ovals – adds a touch of complexity (while still being quick and easy to do). And these are great. 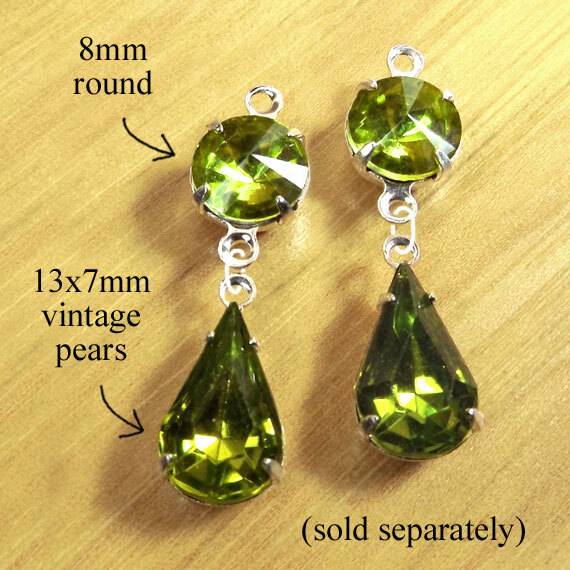 Used “as is” or with the faceted crystal ovals, or with your own special combo, you’re going to have a terrific pair of DIY earrings! This is one of my favorite ideas when I make jewelry for myself (or for customers): use a lot of color. Play with new combinations, shapes, and materials. Don’t spend a fortune. Have FUN with these DIY jewelry designs! 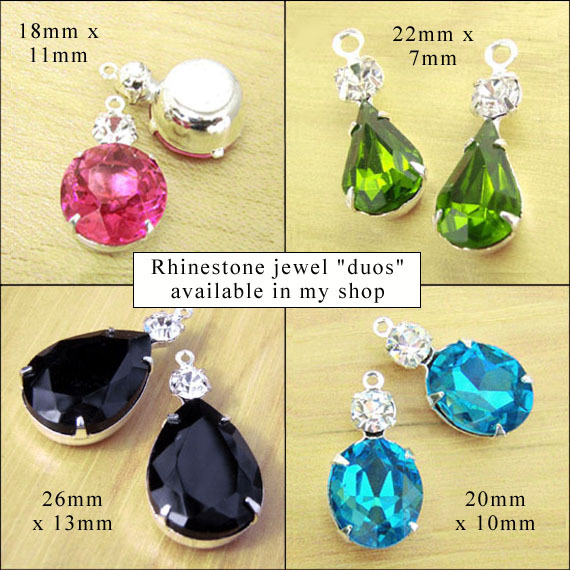 The link is to the rhinestone beads and jewels in my shop, because these affordable faceted glass gems are the cornerstone of a lot of beautiful jewelry designs. I’ve got a lot of colors and shapes – and if there’s something you’re looking for and can’t find, please drop me a note. I might have some stashed (or know where you can find some)! I’m going to be trying a lot of fun new designs – and I’ll show them here, to maybe spark an idea or three among you all. If you think of a fun new combo, maybe you could send a pic and share? Let’s have a wonderful 2018! Let’s face it, we need it. There is so much to worry about, and most of us are just trying to do the best we can, love our families, pay our bills, and have a little fun along the way. Simple, human goals, and sometimes it seems like the Powers That Be are conspiring to make all that impossible. So I figure we should do our best to make it possible. Love each other as best we can, appreciate our friends and our neighbors, get involved in our communities, and try to be kind. All things to aspire to, yes? And have a few little pretties along the way, to share with friends, loved ones, and treat ourselves. That’s where I’m at this year. Red and orange glass teardrops – gorgeous DIY earrings! A customer recently requested this unusual combination of colors – and I hope my pics have conveyed a little bit of the beauty, because they looked fabulous together! Vivid red and orange (hyacinth orange, to use the exact rhinestone name) aren’t usually used together, so that’s fine. But sometimes we like doing the unexpected, you know what I mean? “Choose your color” is the theme here. Just don’t worry about trying new combos!